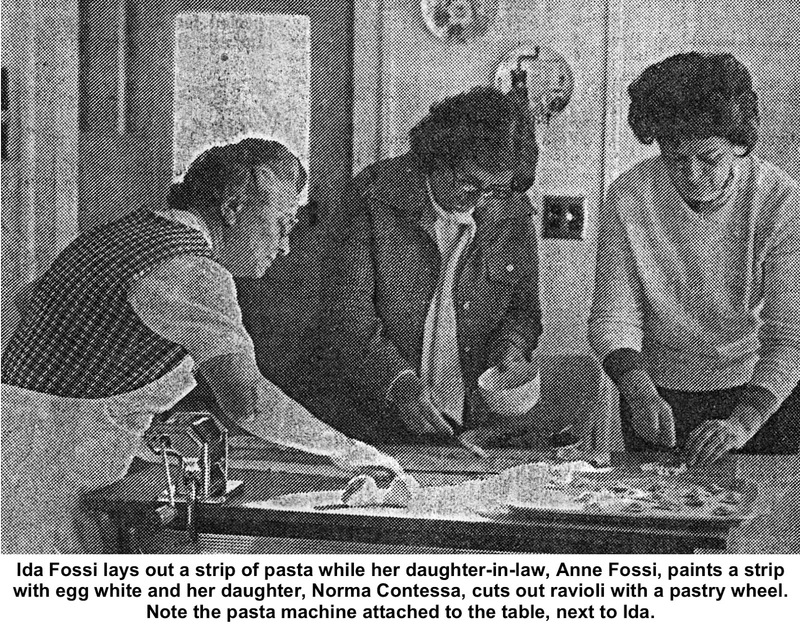 Ridgefield Press, Feb. 24, 1977 — Homemade ravioli like the kind Mrs. Domenic Fossi prepares on special occasions is a whole different ballgame from the somewhat limp squares of stuffed pasta in sauce which we had tasted before we tried hers. And for anyone who has, or can borrow, a pasta machine, these little spicy Italian mouthfuls are not hard to make. Her grandchildren love ravioli, Mrs. Fossi explained, and after one bite we came to the conclusion that anybody’s grandchildren would love them! Ravioli takes time to make, however, so Mrs. Fossi also showed us how to make some marvelous cheesy noodles for soup which can be prepared quickly and ground out through an old fashioned meat grinder. These are called passatelli and are as unusual as they are good. Both ravioli and passatelli freeze successfully. Ridgefield’s First Selectman, Louis Fossi, was one member of a large family which grew up enjoying such treats. Mrs. Fossi is his mother. Her daughter, Norma Contessa, and Mrs. Louis Fossi were on hand to learn exactly how to make the ravioli. With one accomplished ravioli-maker in the family, they have tended to have other specialties. Good eating has always been a family tradition, and Norma reminisced about the homemade ice cream they took turns cranking in an old-fashioned machine when she was a child and the Fossis lived on a farm in Ridgefield with plenty of cream from the cows. Cook pound of fresh spinach and chop fine. Mix well with other ingredients. Reserve extra two egg whites to use later. Mrs. Fossi makes a mound of flour on a board, then scoops a hollow in the center of the flour and pours in the ten yolks and eight whites. Then she kneads the egg into the flour with her hands. If the dough were to be rolled out by hand in the old-fashioned way, it would require quite a lot of kneading, and then an hour’s time to rest before rolling out, she says. But by using a pasta machine, the cook cuts down the kneading to a minimum. Also, the pasta machine makes the hour’s rest unnecessary. Mrs. Fossi pushes a small flat oval of the dough into the widest adjustment in the slot in the machine. The machine has two rollers and a handle which turns these in such a way that they pull in, and flatten the dough in the slot between them. The long thin strip of dough which results gets folded double and put through the slot again, then folded and pressed through the rollers a third time. An attachment on the machine will vary the space between the rollers. She adjusts the space between the widest and the narrowest, then puts the strip through again. Then she adjusts the machine to the next-to-the-narrowest width, and puts the dough through again. By this time the dough is in a long strip, several inches wide and very thin. This strip of pasta gets laid flat on the board, and Mrs. Fossi beats the two egg whites till frothy and paints the strip with egg white. A pastry brush is best for this job. Then she places tiny mounds of the stuffing mixture two abreast on half of the length of dough and folds the other half of the strip of dough on top. No need to press down to seal the edges. Just take a pastry wheel and cut down the center of the doubled strip of dough. Then cut cross-ways between each set of two mounds of stuffing. Next, trim the outside edges so the tiny dumplings are cut zig-zag and sealed all round. The scraps cut from the edges may be kneaded into a flat oval and put through the machine again, or cooked like noodles and served with a sauce on some informal occasion. Repeat till all dough and stuffing are used. This recipe makes between 200 and 300 ravioli squares, depending on size. Mrs. Fossi generally doubles the recipe and simply spends a day making lots of ravioli. She suggests a beginner might wish to halve it and try making ravioli for four. To freeze the ravioli, Mrs. Fossi puts them in a single layer on a cookie sheet and, as soon as they are frozen enough to handle, packs them in plastic freezer bags, each bag containing enough for one meal. tasting. It should be “al dente,” or firm to the tooth, not mushy like canned ravioli. If frozen squares are dropped into the boiling water, the ravioli should be done about three minutes after the water comes back to a full boil. Drain, top with tomato sauce and freshly grated real parmesan cheese (we cut cheese in squares and grate it in a blender, but the texture is even nicer grated by hand the way Mrs. Fossi does it.) She served a dry red wine with the ravioli. At a holiday meal, this would be a first course, followed by a roast and vegetable and then dessert and coffee. Freezer buffs may like to make spaghetti sauce wholesale the way Mrs. Fossi does. She browns five or six Italian sausages and a piece of chuck in sausage drippings, adds a small onion cut fine and two cloves of garlic, and when these are golden brown, takes out the sausage and chuck, and adds about a pound and a half of chopped meat, and browns that. Then she puts sausage and chuck back, adds 28 ounces of tomato puree, eight six-ounce cans of tomato paste, and enough water to make a sauce that can simmer for three hours. Her daughters say they add some whole canned tomatoes, too, and Mrs. Fossi noted that the amount of onion and garlic can be varied to taste. The maker also adds salt and pepper and spices as desired. 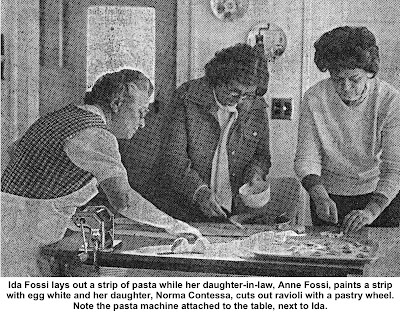 Generally, Mrs. Fossi removes the sausage and chuck and serves those for supper on the day she made the tomato sauce. The sauce gets frozen in quart containers and thawed as wanted for ravioli and other treats. Be sure to use a rich, meaty sauce on the ravioli, Mrs. Fossi says. But suppose you don’t have a pasta machine, or time to make ravioli. Try passatelli. The mixture should be pretty firm, almost like bread dough, but moister. It will stick to the hands slightly as you kneed it. Put dough through meat grinder. It will come out of the holes as small, slightly rough noodles. You can freeze these now and use later if desired. Drop into simmering chicken stock and cook seven minutes. The resulting chicken soup is just the thing for cheese lovers. The chicken soup may contain diced chicken meat, or just the passatelli — marvelous either way. Mrs. Fossi follows her usual custom of making lots of chicken stock all at once and freezing in meal-sized amounts. Into several gallons of water she puts one chicken, a few ribs of celery, carrots, a small can of tomatoes, and near the end when the chicken is tender, salt and pepper to taste. The chicken becomes chicken salad for immediate consumption and the stock goes in the freezer.